A holiday or vacation is the ultimate blessing, anyone could ever get. Especially if it is a week long holiday that you have managed to earn after a good long year. My idea of a holiday is simple - Keep calm and put your travel mode on. I love travelling, and so instead of only sticking to the popular tourist areas, I do some research in order to explore interesting destinations. Recently, I managed to take almost a month off from my schedule, and traveled to various cities in India. A week in Konkan was one of them. As usual, beaches, historical monuments, ghats and temples were my hangouts. My friends say, "If you can't find Priya in Mumbai, you might find her at a beach, a fort, or some temple." Well, I couldn't agree more. My favorite beaches are the ones on the Konkan coast. Quiet, calm, and serene, these beaches are far from those typical commercialized beaches, where hawkers and bystanders will keep irritating the hell out of you. The sea water is clean, so much so that you can spot a variety of fishes and sea shells from a distance. When the cold water splashes against your feet, you can't help but dance with joy. The pristine white sand welcomes you, as you sit down to doodle your name on the shiny little particles. On a trip to the beach, dresses, shorts, leggings are your best bet. Flat shoes are more comfortable and suitable, especially the ones without any straps. I prefer those over any other variety, because you can quickly get rid of your footwear when you spot a virgin beach in the middle of nowhere. I always carry one or two pairs of osho flats in different colors. While we are on the topic of apparel and accessories, I must add that you get some fabulous accessories in Sawantwadi. I picked up some funky bangles and cute earrings during my recent trip. As they say, "When you are travelling, take some time out to shop for local favorites." If you like experimenting with food, then you shouldn't shy away from trying the local delicacies. Konkan is famous for its non-vegetarian delights, and the never ending love affair that we maharashtrians have with 'Kokam Sharbat' (you can see me posing with a glass, in the photograph above). So when in Konkan, have your share of Malvani macchi fry and Malvani Chicken Sukka. Vegetarians, don't fret! You will get the best Kaju malvani masala and Vangyacha bharit, which will leave your taste buds happy. If you are a Mango fanatic like me, visit Konkan during the summer season to gorge on endless number of mangoes. Hey..m frm Konkan..n cant get enough of it..Apart frm the kokam sharbat, m a fan of Kokam kadi/Sol Kadi..n yes the malvani style food is just too good. Glad u had fun at Konkan. Nice! Looks like you've had a great time. 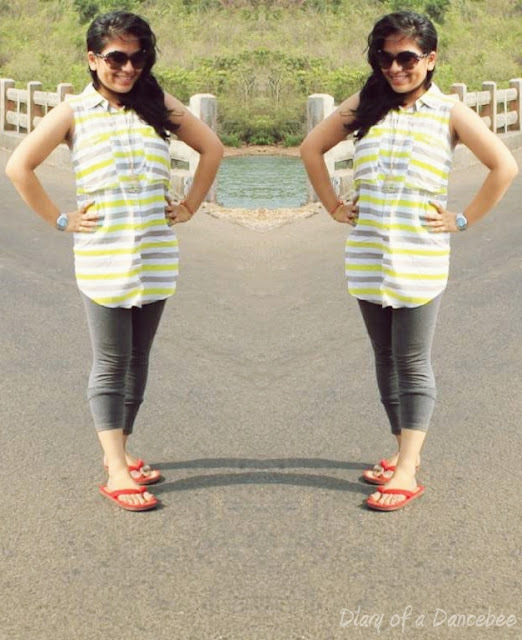 I've been to Sawantwadi as well, pretty awesome place, and I totally agree with the beach get-up. Skirts, shorts and leggings are all I wear!